PROPERTY buyers will enjoy a minimum of 10 per cent discount on properties priced between RM300,000 and RM2.5 million, transacted from January to June this year. 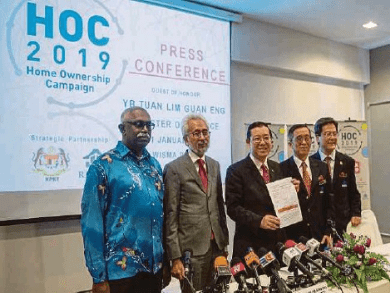 Launched under the Home Ownership Campaign 2019 (HOC) yesterday, Finance Minister Lim Guan Eng said the newly launched incentive was to address the property overhang issue in addition to reducing home prices in the market. “The government has decided on a joint effort between the government and the Real Estate and Housing Developers’ Asso ciation (Rehda), which will see discounts at a minimum of 10 per cent as well as stamp duty exemptions for unsold and under construction properties.